Hello little blog! I have missed you and I am sorry that I have been so quiet but so much has been happening in my life that I was scared that if I started writing, I would not stop and your page would be filled with a million thoughts. So much has happened since I last wrote to you. Some of them have been good, some have been bad and some have smashed my little heart into pieces. But I’ve picked the pieces up, taped them back together and tried hard not to show how it hurts. I am stronger than I think and boy has that been tested this year! It has been a few months of rainbows and storm clouds! 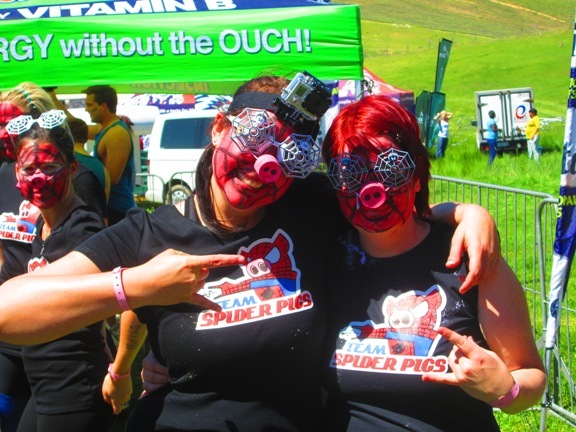 Since we last spoke, I have done the Impi Challenge 2013,and our theme was Spyder Pigs all 12km of it and made it through pretty reasonably considering I didn’t manage to get as fit as I thought! I crawled under barbed wire, crawled through a sewerage pipe that had water in, jumped off a 3m ledge into a freezing dam and I finished the race! I did it! Little old couch potato over here did it for me! B is getting older and I threw a party for her at her school this year and she was so happy that I was there that she refused to allow me to sit anywhere else but right next to her and kept smiling at me and saying “My Mommy is here” and telling all the other children! My baby is 3 now and her birthday was quite hard for me but I made sure that my princess knew that she was loved by everyone around her and gave up a few things so that she could have a weekend that she would remember. I don’t know where the time has gone. She also went for her first ad for a catalogue and I was sooo proud of her! She was so good and listened to the people. My little princess is turning into a little girl and although it still breaks my heart when she hurts or curls into my lap and needs an extra cuddle when she is sad, we have gotten to the point where she will tell me how she feels. Getting her dressed in the mornings has become extra interesting as she now wants a say in what she wears so some days she does go to school with shoes that don’t match her outfit but I am teaching her how to make choices for herself. Sometimes it’s still hard doing this by myself but I have a great support system that love us dearly and gives me guidance. The past few months people have played with my emotions, played me against other people, tried to use me as a pawn and this has been very very hard for me. People made choices and broke my heart but I have learnt some very hard lessons, things that I never thought that they would be forced to do. Some days it makes me very sad but you know what little blog, I am working with it step by step and when it feels like I don’t have any more strength, I look at my little girl and I remember what her name means (“God’s promise”) and I remember that I am not alone. I’ve had to deal with things that I would not wish on my worst enemy but have found strength in her, my friends and most of all my family. When it gets too much for me I remember who was has been there and I love each and every one of them with more than they will ever know. So what I am trying to say little blog, is that I am back, I won’t leave you alone again because I think you need me as much as I need you. 2014 is going to be an amazing year and together we will get through this. Thanks to all the people that send emails or tweets asking how I am, you are amazing and all your prodding has reminded me that I need to write, if not only for me but for those of you who seem to not feel so alone by my writing. You are never alone! Always remember that! So here is to the end of 2013 and the Christmas season and to the start of an amazing 2014.